The Evader’s Garden memorial at Astley Park, which was designed by award-winning designer John Everiss, has been targeted by mindless vandals numerous times in the last six months. Fears returned this past week after the memorial, which honours more than 5,000 Chorley borough servicemen, was fenced off by Chorley Council. 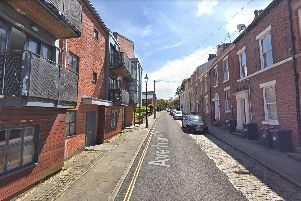 The report received reports from members of the public of the incident, with one describing the suspected vandalism of the brickwork as “really demoralising”. But the fears were calmed by the council after an investigation into the reason behind the damage. The investigation, which included fencing off the garden to restrict public access, found that vandalism is not the likely cause – with the damage potentially connected to the removal of the stained glass window for repair work after it was vandalised in November. Rebecca Huddleston, Director of Policy and Governance at Chorley Council, said: “On Friday March 29, we discovered that part of the award-winning Evader’s Garden in Astley Park had collapsed and we have had to secure the garden temporarily. “While the window in the garden had been damaged previously and was out for repair, we do not believe it was vandalism on this occasion. In November last year deputy leader of Chorley Council, Coun Peter Wilson, announced the authority was reviewing its security after the Second World War memorial was vandalised for a second time in just over a week. Unknown vandals had reportedly throwing bricks through the memorial’s stained glass window honouring thousands of serviceman who put their lives on the line for our country. It was repaired in time for Remembrance Sunday commemorations but soon afterwards was subjected to further damage. The window is still to be placed back in the garden but is something that the public can expect in the near future.